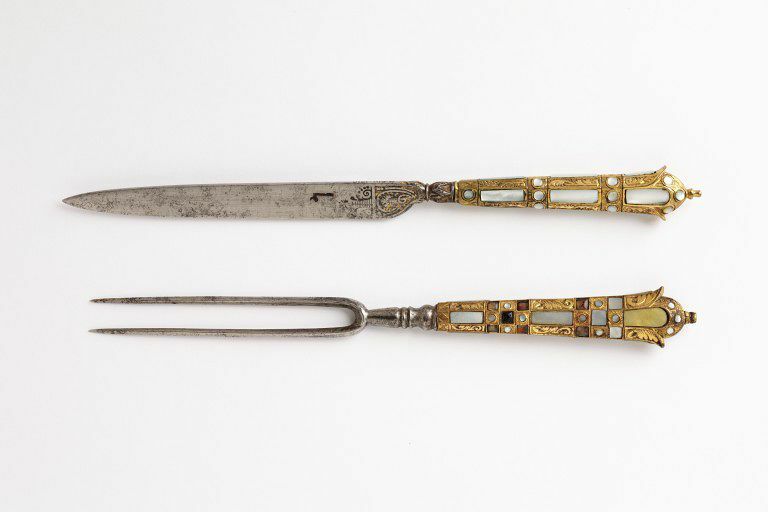 The brass handles on these pieces are inset with mother-of-pearl, an exotic material often set into precious metals and displayed in the treasuries of Renaissance princes. Cutlers specialised in making blades. They trained as apprentices for up to seven years, working for a freeman cutler who housed and fed them. In England a cutler would have to prove himself as bladesmith and hafter (maker of handles) in order to obtain the freedom of the Worshipful Company of Cutlers, gain his own mark and set up his own business. Many cutlers acted as middlemen who bought blades from bladesmiths, handles from hafters and sheaths from sheathers. They assembled the cutlery themselves and sold them under their own names. Knife and fork with handles of engraved brass set with mother-of-pearl plaques and beads. 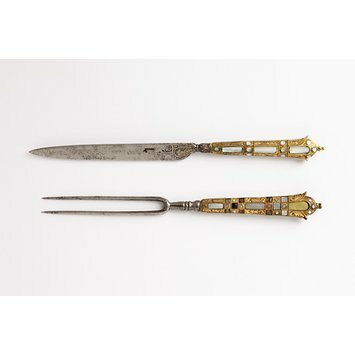 Knife and fork, handles of brass and mother-of-pearl, France, 1580-1620.